Jonathan Gold: Can Food Be Authentic? As part of the Zocalo series, I went today with Christopher to the Skirball to see Jonathan Gold, Pulitzer-prize-winning food critic of the LA Weekly. The only food writer, I might add, to have ever won that distinction. He was moderating a panel entitled Can Food Really Be Authentic? with “a panel of Los Angeles’ best-known chefs” on which were Nancy Silverton of Mozza/Campanile/LaBrea Bakery, Jim Shaw of Loteria Grill, Sarintip “Jazz” Singsanong of Jitlada, and Roy Choi of KoGi truck faaaaame. Yeah. With that lineup, it was pretty awesome. 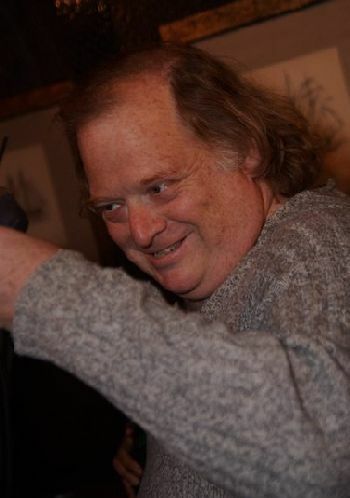 What does Jonathan Gold look like? Well. 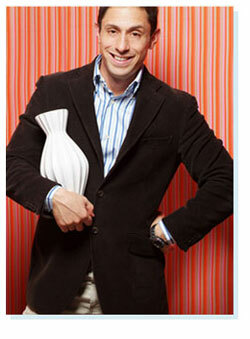 I had heard him on the radio, on KCRW’s Good Food, and he sounds just like Jonathan Adler. And since they had the same name, I assumed they looked the same, but in my head, Jonathan Gold was a red-headed version of Jonathan Adler. No. The man up top does not look one bit like a ginger Jonathan Adler. He looks, according to Christopher, more like Chris Farley, and his interview style, apparently, is just like him too. Gosh, what a character! I loved him. He speaks as if he is writing, very thoughtful. Unfortunately, he also had dry mouth? or something? and made awful chewy smacking saliva noises loudly into the microphone as a preface to each of his sentences. Michele Norris has nothing on this man. So Jonathan opened with a meditation on ravioli. In Italy, they have ravioli with cow udder inside – a longstanding tradition in a certain region of the country. Now, to be “authentic,” and recreate this ravioli in LA, one would have to comb various weird markets to see if cow udder is sold commercially (it’s not), so you’d have to go to a special butcher, and somehow haggle with him to get him to sell you this random part from a cow that usually gets thrown away. Then, you’d have your ravioli, dripping (and stuffed) with authenticity. “But is it truly authentic?” posed JGo. The whole point of ravioli is to feed many with a small amount of protein. The whole point of ravioli is to use what’s close, convenient, cheap. Haven’t we lost the entire meaning behind the dish, thereby negating any sort of authenticity? Good point. He went on to offer several thousand more examples in the same vein (“I THINK I GET IT” I whispered to Christopher), and segued to a story about a dish in Italy that is a gigantor carp prepared like a pig (how did he get there, I do not know, as I was zoning out and itching to play Wurdle on my iPhone). He totally cracks himself up. Very cute. He also talked about how he has stricken the word “authentic” (also “ethnic”) from his lexicon. I shall do the same. He then turned the floor over to Nancy Silverton, who looked like a cool chick to hang out with. She had on an outfit that, if I were 15 years older, would likely DIE for, and just a very alluring speaking style. I was very focused on craning my neck to see her dress and wondering how she was doing since she lost all her money to Madoff and didn’t quite pay too much attention to what she was actually saying, except that Italy is similar to LA in climate, and when she started her restaurant here they put her in a new category of food – Calitalian. As if her food was not worthy of being called true Italian, even though her food was delicious according to JGo. The true star of the night was Roy Choi. I won’t rehash the whole story about how his Korean taco truck is getting tons of press, serves 400 pounds of meat a day, with lines that were, when JGo visited his truck, over 600-people-long. He got famous via Twitter, with KoGi fans creating a KoGi network, constantly twittering the truck’s location (the truck has since gotten its own twitter account – go follow it). OK, I just rehashed the story anyway. Damnit. The night ended with Jazz Singsanong. She looked like one of those Asian ladies you see gambling with their Prada glasses late at night at Caesar’s Palace, but when she opened her mouth she was soooo adorable. She took over Jitlada only three years ago, and now the place is a phenomenon, serving super authentic southern Thai cuisine. But when she and her brother first opened the place, there was very little business. One day she found the kitchen empty and asked her brother where all the food was. He explained that there was no money, because there were no customers and every day they threw out what they didn’t serve, because their food was made fresh from scratch every day – the curries, the sauces, everything (and now, all the herbs including things like lemongrass and kaffir lime leaves are grown in the garden of her LA home, or else out in front of the restaurant – COOL!). So she said she had to take the money out of her bank account, which was scary because the restaurant was not doing well and, she said, her husband would be very angry with her for taking their money. But, she said, she found the courage to do it thanks to … Oprah. lol. She said she knew that if her restaurant failed she would write Oprah and tell her about how she came to the US with just one suitcase and $200 in cash, and had a dream to open a restaurant. Nothing more authentically USA than Oprah, ladies and gentlemen. Listen to the complete podcast here or watch the video! The moral of the story is, sometimes the authentic original isn’t great. It drives me crazy anyway when people say, “It’s SOOO AUTHENTIC!” as if that’s the holy grail. I think Panda Express is just as yummy, in a different way, than the Chinese food I had in Hong Kong. I’m ready for my Pulitzer now. K thx bai. This entry was posted by janet on March 12th, 2009. You can follow any responses to this entry through the RSS 2.0 feed. You can leave a response, or trackback from your own site.